For the pineapple, lop off the top with a knife and scoop out the pulp with an ice-cream scoop. Using a paring knife, carve whatever kind of face you prefer! Use a cinnamon stick as a nose, if you're feeling wacky. 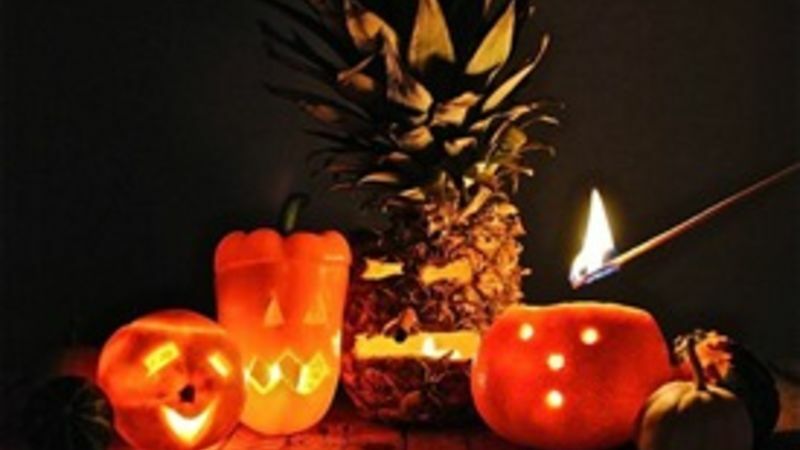 Stick a tea light inside the pineapple and voila, lantern! For the orange bell pepper, lop off the top with a knife and pull out the seeds and ribs on the inside. Again, using a paring knife, carefully carve out a silly face in the pepper. Totes easy. Using a pencil, poke a hole in the bottom of the pepper and stick a white candle through it. Done! For the grapefruit, Slice off the top with a paring knife and scoop out the pulp with a spoon. (drink the pulp while you're at it.) Using a straw, poke little holes in the fruit, creating a little face. Pretty cute, eh? Stick a tea light candle down in it, light, and you have a lantern! For the orange, slice off the top with a paring knife, and scoop out the pulp. (drink, drink) Go ahead and slice off a tiny hole in the bottom of the orange and wiggle the tea light candle into place, taking us less space inside the fruit. Carve your desired face with the knife, light and there's your lantern. Success! Wait a minute: Jack-o-Lanterns….with fruit? Oh heck yeah, with fruit! Unless you're Hulk Hogan and can lug 439 pumpkins around, I say go the lighter route and carve some fruit and veggies instead. Plus you can eat the innards and be all healthy and stuff. These little lanterns are pretty genius because they are so small, you really only need a pairing knife and a spoon or ice-cream scoop to do the dirty work. I even used a straw on one lantern. A STRAW, you guys. The cast of characters: A pineapple, an orange bell pepper, a grapefruit, and an orange. They don't seem too frightened, do they? I started with the orange bell pepper, and you know what? Even if his smile is pretty jank, I was only warming up. And it's all about the fun, right? RIGHT? Mini tip: using a pencil, poke a small hole in the bottom of the pepper, and shove a white birthday candle up in it. That way there's not a huge tea light candle taking up all the room. Next we have the pineapple prepping. I found that using an ice-cream scoop worked best. AND, I saved all the pulpy insides for a breakfast smoothie. SCORE. WHOA. Look at Mr. Pineapple Lantern Man. I gave him some attitude…along the lines of Wilson, from Cast Away. That's a cinnamon stick as his nose. I couldn't stop myself. Awww, and then we have sweetie-face grapefruit baby lantern. This little guy had the straw action. After a quick scoop of the pulp, the straw made for the cutest little eyes, nose and mouth holes. I giggled (too much) during the making of him. Quick tip on making an orange-o-lantern: If you use a pairing knife and slice off a tiny hole in the bottom, the candle can fit right in, taking up less space inside the fruit. Nifty, eh? Are you laughing? Because I am. Look at his mouth. And his nose is the stem nubbin' thingy. How are you not at least grinning? And finally, the entire group, together for their glamour shots. They’re practically glowing. BA-DOMP. Make these this Halloween! With your kids, on a date, alone. Just make it happen!